Households typically have significant wealth outside of their investment portfolios, such as human capital and real estate. Considerable research, echoed by many financial advisors, has shown that investors should consider the risk of these nonfinancial assets and adjust the allocation of their financial assets accordingly. While much has been written about the models that determine how portfolios should be invested (or adjusted) given the presence of nonfinancial assets, there is little empirical evidence as to whether investors actually incorporate these nonfinancial risks in their portfolios, especially without the assistance of an advisor. In this article, we use allocation data from 81,162 participants managing their portfolios in 368 defined-contribution plans to determine the extent that portfolio risk levels vary in the presence of two types of nonfinancial assets: industry-specific human capital and region-specific residential real estate wealth. A body of research provides insight into how investors should consider nonfinancial assets, such as human capital and residential real estate, when building a portfolio. These models typically suggest that the optimal portfolio for an investor with nontradable income (or wealth) should deviate from the market portfolio to the extent that he or she is different from the average person. For example, focusing on human capital, Cochrane (2007) emphasizes two potential sources of deviation from the market portfolio for a given level of risk aversion: 1) the relative weight of human capital and other outside wealth as a percentage of total wealth and 2) the difference in the riskiness of the investor’s human capital and other outside wealth compared with that of the average investor. The lack of empirical research documenting how investors respond to nonfinancial risks from a portfolio perspective is somewhat surprising. Defined-contribution plans are an ideal source of data for this type of analysis because the employer must select its industry (based on the North American Industry Classification System code) as part of annual federal filing requirements. The recordkeeper, which also must have each plan participant’s physical mailing address for correspondence, has detailed demographic information on participants. Our analysis is based on portfolio allocations obtained from a U.S. recordkeeper as of Dec. 31, 2017. All plans are 401(k) plans. We applied filters to the participant population, such as availability of demographic information, holdings information, and other criteria. A total of 81,162 participants passed the screens and are included in the analyses. We focus on “proactive” investors in this study. Our definition of a proactive investor is someone who was not defaulted into his or her investment election, does not have more than 90% of his or her retirement assets in an allocation fund (which would be a multi-asset or diversified investment such as a target-date fund or a balanced fund), and has not received any type of formal investment advice in the defined-contribution plan. Defined-contribution participants tend to have significantly higher incomes than average Americans, and our focus on proactive investors further biases our data set. Our test population has higher incomes and balances even compared with average defined-contribution participants. Investors with riskier human capital, as proxied by industry of employment, will have lower equity exposure than will investors with less risky human capital. 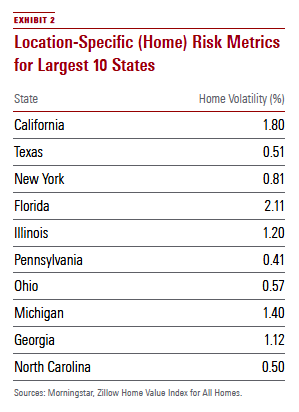 Investors who reside in states with more volatile residential real estate prices will have lower equity exposure than will investors who live in states with less volatile home prices. Do Investor Portfolios Differ by Industry and Location? We explore the differences in investor portfolios across both industry of employment and state of residence for our analysis. For each employee, the industry code for the company and state of residence are known. We run a series of ordinary least squares regressions to see if there are differences across industries and states of residence. The dependent variable for all of the regressions is the investor’s equity allocation, which we use as a proxy for portfolio risk. Equity allocation is an accessible metric of risk and is the predominant way recordkeepers and financial advisors tend to relay the risk of a portfolio to participants and investors. A number of independent variables are included in the regressions. The primary demographic control variables are age, years of plan participation (plan tenure), income, balance, deferral rate, and gender. We include age and age-squared in the regressions as equity allocation is lower during the early and late stages of the lifecycle. We include the natural logarithm of salary and balance to correct for the skewness implicit in the values. We include the 10 most common industries. For location, we include the 10 states with the largest number of participants. We find a couple of important takeaways from the regressions. First, several industry and state dummy variables have statistically significant coefficients. This suggests that equity risk levels vary by industry of employment and state of residence. Second, the coefficients for the industries and states do not vary greatly when only one is included or both are included in the models, which suggests the risks are relatively independent. It is not clear, however, whether investors are adjusting portfolios in a way that is consistent with economic theory. We address this question next. In this section, we first build models to estimate the risks associated with industry-specific human capital and location-specific residential real estate. These models are explained fully in the main paper and summarized here. Human capital risk is estimated using a similar model as Blanchett and Straehl (2016), where risk is defined as the change in total wages for the respective industries from 1988 to 2017. We focus on total wages, versus average (or median) wages, because industries such as construction have seen relatively consistent wage growth historically but significant changes in total employment. We also use total compensation volatility, versus a more complex approach, because total compensation volatility is consistent with how most investors experience the risk of human capital. EXHIBIT 1 shows the values of total compensation volatility by industry. For location-specific residential real estate risk, we use the annual change in the Zillow Home Value Index for All Homes at the state level. The Zillow index is a smoothed, seasonally adjusted measure of median estimated home values for a given region. Monthly index values are available from April 1996 to December 2017. We use home price volatility as the metric for housing risk for our analyses. EXHIBIT 2 shows the resulting values for the largest 10 states, according to Zillow. To understand if investors with riskier (or less risky) nonfinancial assets have more (or less) conservative portfolios, we run an additional set of ordinary least squares regressions with equity allocation as the dependent variable. For these regressions, we include the same base demographic control variables as the previous regressions; however, instead of including the respective industry or state of residence as dummy variables, we include the respective risk measure for each industry (total compensation volatility) and location (home price volatility) based on the investor’s respective industry of employment and state of residence, which are coded as continuous variables. The regression results provide strong evidence that investors are investing consistent with economic theory, given the negative coefficients we find for the human capital risk and location risk variables. The negative coefficient implies that as the risk of these nonfinancial assets increases, the participants have less equity exposure. The slopes for human capital risk and location risk are both statistically significant, but there is some question to economic significance, especially in light of what past research has suggested is optimal. The risk coefficients vary by model, averaging approximately negative 0.5 for both human capital and location risk. If we apply these coefficients to the range of risk values for each industry and state, the equity differences in portfolios would range by approximately 5 percentage points for the human capital adjustments and 2 percentage points for the states of residence. These ranges are significantly lower than the optimal differences noted in past research (see Kyrychenko 2008; Eiling 2013; Blanchett and Straehl 2015). Therefore, while investor allocations are directionally correct, the magnitude of effects deviates from what is considered optimal. The regression includes control variables for various demographic factors, but it does not provide information on which types of investors correctly incorporate nonfinancial assets into their household portfolio. In other words, it is not clear which investors are making portfolio decisions that are closer to optimal. To determine this, we run an additional set of logistic regressions. First, we estimate the residual of the equity allocation not explained by the base demographic factors. We determine what the target equity allocation would be based on the demographic variables. We then subtract this estimate from the actual equity allocation to determine the residual value. We only consider whether the residual equity value is positive or negative (for example, if the investor is investing more or less aggressively than the demographic variables would suggest). We are not concerned with the magnitude of the risk, just whether it is above or below average. We then determine if the risk of the industry is consistent with the optimal risk level of the portfolio. For example, if the industry has above-average risk, the investor would ideally have below-average equity allocation or vice versa. Investors are considered to be correctly invested if industry risk aligns with our equity-allocation expectation. The dependent variable for the logistic regressions is whether the participant invested “correctly.” If the participant is invested correctly, he or she is assumed to have a value of one, else zero. We include the base demographic variables as independent variables in the regression (age, plan tenure, salary, balance, deferral rate, and gender) to determine their relationship with making the correct decisions. We find that the logistic regression results vary depending on the risk factor. It appears that older investors, investors with higher salaries, and female investors tend to have a higher likelihood of making the correct risk decisions. The positive relation between income and correctly aligning nonfinancial risk with equity allocation is especially important for this analysis, given that our data include income levels that are well above average compared with either the average American or the average defined-contribution investor. A data set with income levels that are closer to the median (or average) American may reach different conclusions. In this article, we explored the association between nonfinancial assets and portfolio risk decisions for defined-contribution plan participants. We noted that investors who work in different industries and live in different states have equity allocations that differ, and these differences are generally consistent with economic theory. An investor with riskier human capital tends to invest his or her portfolio more conservatively, and vice versa. While the results were statistically significant, they were not always economically significant based on the prior literature. These findings have important implications for investors, as well as financial advisors. First, additional analyses should be conducted exploring how investors consider nonfinancial assets when building portfolios. In reality, there are a number of variables that exist outside the plan that we do not have data on that may affect the investor’s portfolio allocation (such as marital status or outside assets). It is also not clear whether the results would persist for other types of investors (such as those investing outside of retirement plans). Second, it is possible that risk preferences, rather than the riskiness of human capital, are affecting equity allocation percentage. It is possible that investor risk preferences drive the decisions of which employment sector investors participate in, as well as the allocation to equities within their portfolios. While our data suggest portfolio risk is offsetting the other nonfinancial risks, there could be unique aspects we are unable to test or unique employers for which we do not have data (in particular, government employees). Third, the growth in use of target-date funds significantly simplifies the investment decision-making process for most investors. The target-date fund concept is consistent with lifecycle theory, where allocations become more conservative as the investor approaches retirement and human capital is depleted. It is not clear, though, to what extent defined-contribution plan sponsors (and their consultants) consider human capital risks when selecting the plan default. Industries with safer human capital (such as healthcare) should generally have more aggressive glide paths (and vice versa). Finally, this analysis deals with relatively broad risk definitions for human capital and location. In reality, there are systematic and unsystematic aspects associated with each that could be explored in future research. Still, financial advisors can use the results of this study to help improve asset allocations for their clients. Whether it be through altering default investment options or enhancing the investment policy statement, investor outcomes may be improved by incorporating nonfinancial assets within a holistic portfolio framework. The complete version of this paper, “Do Investors Consider Nonfinancial Risks When Building Portfolios?,” can be obtained by contacting the author at david.blanchett@morningstar.com. Including the District of Columbia, which is included for consistency purposes. Blanchett, D. & Straehl, P. 2015. “No Portfolio Is an Island.” Financial Analysts Journal, Vol. 71, No. 3, PP. 15–33. Blanchett, D. & Straehl, P. 2016. “Portfolio Implications of Job-Specific Human Capital Risk.” Journal of Asset Management, Vol. 18, No. 1, PP. 1–15. Cochrane, J.H. 2007. “Portfolio Theory.” February 2007, University of Chicago Graduate School of Business, Working Paper. Eiling, E. 2013. “Industry-Specific Human Capital, Idiosyncratic Risk, and the Cross-Section of Expected Stock Returns.” Journal of Finance, Vol. 68, No. 1, PP. 43–84. Kyrychenko, V. 2008. “Optimal Asset Allocation in the Presence of Nonfinancial Assets.” Financial Services Review, Vol. 17, No. 1, PP. 69–86. This article originally appeared in the Spring 2019 issue of Morningstar magazine. To learn more about Morningstar magazine, please visit our corporate website.